Welcome! My Name is Stephanie Marcel and I am an aspiring artist here in Kansas City Missouri. 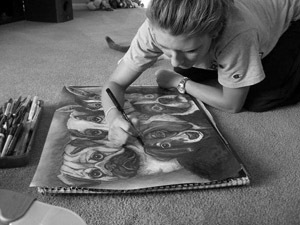 My artwork is most often influenced by one of the things I love more than anything, which is animals. I have been painting, sculpting, and drawing as far back as I can remember. It has always been a passion of mine... one I believe I was born with. I have had some wonderful Art teachers and I've studied various forms of art expression at a couple local colleges, but the one person who I would say has inspired me the most is my father. He is an amazing artist and he helped me become the artist I am today. My Mother has been so supportive and was by far the person I credit for giving me the most encouragement to work towards my goals as an artist; she has always believed in me. Also, I have a amazing Grandma who can make almost anything. Growing up I was always fascinated by her artistic abilities; she has greatly influenced my passion for art. My style is very unique because it is very distinct. All my work has character and is very expressive. I can work at a more realistic level, but my best work is often when I just pour my heart into the piece I'm working on and let my natural style take its course. My work has a cartoon feel...but on a more sentimental level. I can create almost anything because I love doing it so much. I love pushing my limits and creating successful pieces that people can enjoy.